Four Continents. 28 Countries. 95 Ports. 67 UNESCO World Heritage Sites. 17 Overnight Stays. 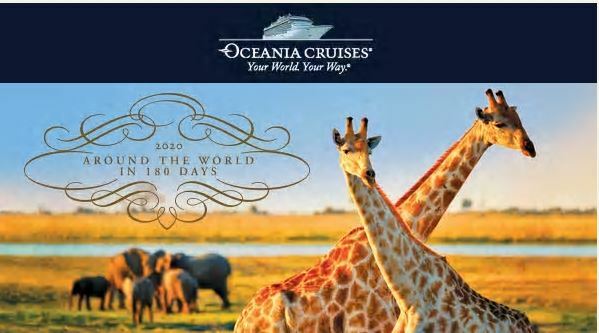 Oceania Cruises has just announced their full itinerary for their highly anticipated 2020 World Cruise! This cruise typically sells out very quickly due to the limited number of spots available – the Insignia holds only offers 342 lavish suites. Please contact us right away if you are interested in receiving a complimentary quote on this epic adventure! Book Soon - Selling Out Quick! Insignia begins her Around the World journey in Miami transiting the Panama Canal from Miami to San Francisco while exploring picturesque ports in Central America, Mexico and Baja California. Insignia then travels to South America to call on a wide array of iconic and boutique ports throughout Ecuador, Peru, Chile, Argentina and Brazil. Next, she makes a transoceanic journey to Africa while discovering off the beaten path ports in Senegal, Gambia, Ivory Coast and Ghana. The exploration continues along the dramatic landscapes and world-class cities all around Asia including visits to Thailand, Malaysia, Singapore, Vietnam, China and Japan. The expedition deepens as Insignia travels farther north to new ports in Japan, Russia and along the Bering Sea encompassing ports in the Gulf of Alaska and beyond. The odyssey culminates by traversing the Panama Canal once again from San Francisco to New York exploring the best The Americas has to offer. Oceania Cruises’ acclaimed Insignia has undergone a multimillion-dollar transformation to create a virtually new ship that is both sleek and elegantly charming. Her decks are resplendent in the finest teak, custom stone and tile work, and her lounges, suites and staterooms boast luxurious, neo-classical furnishings. Insignia offers every luxury you may expect on board one of our stylish ships. She features four unique, open-seating restaurants, a world-class fitness center and spa, eight lounges and bars, a casino and 342 lavish suites and luxurious staterooms, nearly 70% of which feature private verandas. With just 684 guests to pamper, our 400 professionally trained European staff ensure you will wait for nothing. Cruise fares above are valid for US and Canada residents only. Cruise fares and availability are subject to change without notice. Please contact Oceania Cruises to confirm category availability. Fares are per person, based on double occupancy and reflect all savings. Cruise-related government fees and taxes are included. Checked baggage fees may apply. *Standard terms apply. View complete terms and conditions in addition: Cruise-Only Fares do not include OLife Choice amenities or airfare. OLife Choice offer is subject to change on 4/1/18. OLife Choice amenities are per stateroom, based on double occupancy and subject to change. Free Internet is one per stateroom; Owner’s, Vista & Oceania Suites receive access for two devices per suite. OLife Choice free shore excursions vary by voyage and exclude Oceania Select, Oceania Exclusive, Executive Collection, Food & Wine Trails, Wellness and Culinary Discovery Tours. Voyages up to 9 days receive 4 free shore excursions; 10-13 days receive 6 free shore excursions; 14+ days receive 8 free shore excursions. If shore excursion amenity is selected, all excursions must be chosen at least 14 days prior to sailing. OLife Choice beverage package amenity is House Select. Guests in the same stateroom must choose the same OLife Choice amenity, and amenity must be chosen by final payment. Not all promotions are combinable. All Fares include government fees & taxes.